An interesting piece of Ann Arbor History passed my way today. I first had a notice from EBAY that an item was for sale involving Ann Arbor Freemasonry. The item was a ribbon from a Knight’s Templar Event and if you look closely at the picture of it, you can see the name “C. E. Hiscock"
A fantastic article on one of our most illustrious Sir Knights, Charles Edward Hiscock. 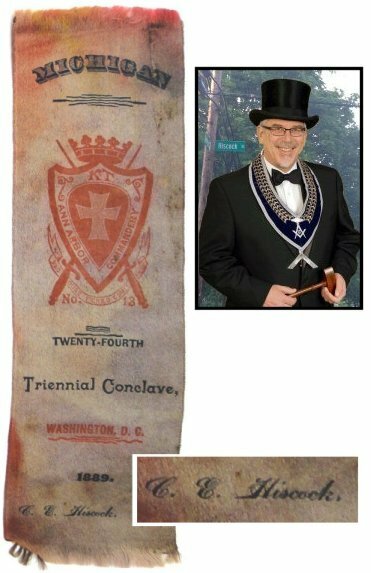 Sir Knight Edward was elected as Right Eminent Grand Commander of the Grand Commandery, Knights Templar of Michigan in 1913, and was the second Past Commander from Ann Arbor Commandery No. 13 to serve as Grand Commander.